SEO is about landing the top result for valuable queries. So to overcome these sites, you have to find out what there doing. And then do it better. And in this post, I’ll show you how to do the “finding out” part of that equation. But let’s kick things off with a quick SEO competitor analysis definition. SEO competitor analysis is an audit of search engine results. You want to find out which sites are ranking for your business keywords. And then find out how they’re doing it. One thing businesses get wrong with SEO is deciding on who to track as competition. Marketing Managers consider their competition as businesses that do the same thing as them. Or businesses offering the same services in their geographic area. In traditional competitor analysis, this is correct. However, the competitive SEO landscape is the search results page. In particular, the top five positions for keywords you’re targeting. It’s common that these positions are occupied by completely different websites than your traditional competitors. Brian makes a great point here. Don’t be surprised to see a few indirect competitors battling for your keywords. 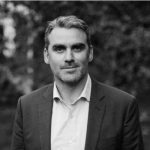 Let’s say you’re a Sales AI SaaS Tool. A valuable keyword for your business would be “AI for Sales”. So let’s run this query in a search and analyze the results. So with this in mind, let’s get into techniques and strategies for tracking competitor SEO. Start SEO competitor analysis by tracking competitor rank for business keywords. Because these are the keywords driving high-quality traffic. To track competitor rank, you have to find SEO competitors first. So use the SERP example technique you saw earlier. Enter your target keyword, and pick out direct and indirect competitors. 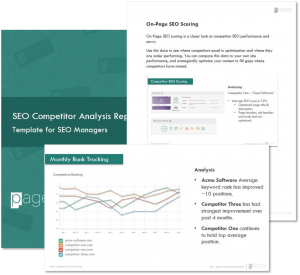 After you’ve narrowed down competitors, use Pagezii SEO Reports to track their ranks. And then keywords you want to track competitive position for. Once the report runs, you’ll see data that looks like this. Now take your competitor SEO tracking one step further. 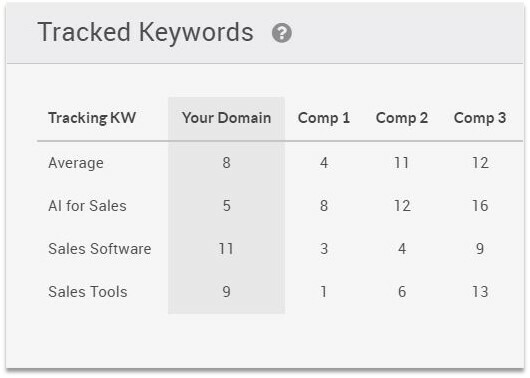 Head over to Google’s AdWords and run your keywords through the Keyword Planner tool. Average monthly searches for each keyword. You’ll know where you stand for target keywords, and which keywords are valuable from a business perspective. Next up, we’ll look at competitor rank trend performance. Tracking search rank over time shows where sites are making progress and where they’re losing out. By analyzing competitor SEO movement, you’ll get an idea of what you need to do. Are they optimizing sites for on-page SEO? Does their site blog often and drive traffic through content? Are your competitors posting on social media? How many backlinks does their site receive? What’s your competitor site UX look like? Answering these questions is going to inform your own strategy. When it comes to SEO, optimizing on-page SEO is the first place to start. So check to see if competitors are optimizing the basics using the SEO Grader Tool. Enter the competitor page you want to analyze. Also, enter the keywords you want to grade their page against. Also, when it comes to SEO, optimizing page title and description hold the most weight. So check to see if competitors are making the most of these tags. Then move on to the detailed breakdown. From here, you can pick apart competitor SEO for a particular page. This shows you what competitors are missing, and what you can capitalize on to overtake them. Content marketing and SEO go hand-in-hand. Because content like competitor blogs and landing pages offer the perfect platform for targeting unique keywords. Jen is bang on. SEO competitor analysis is about to find out what competitors are doing, why it works and then implementing these practices into your own strategy. Do this for competitor blogs using Pagezii’s Blog Pulse Report. Your Blog Pulse report lets you analyze competitor blogs. And for each competitor blog, you’ll see their average SEO score for recent posts. Then download the excel file, and sift through competitor blog content. You’ll see your competitors average SEO score for each blog, and what keywords they’re optimizing for. Analyzing SERPs gives you insight into search engine positioning. But you can also use your SERP analysis to check search intent optimization. Search intent is the orientation behind a user search. 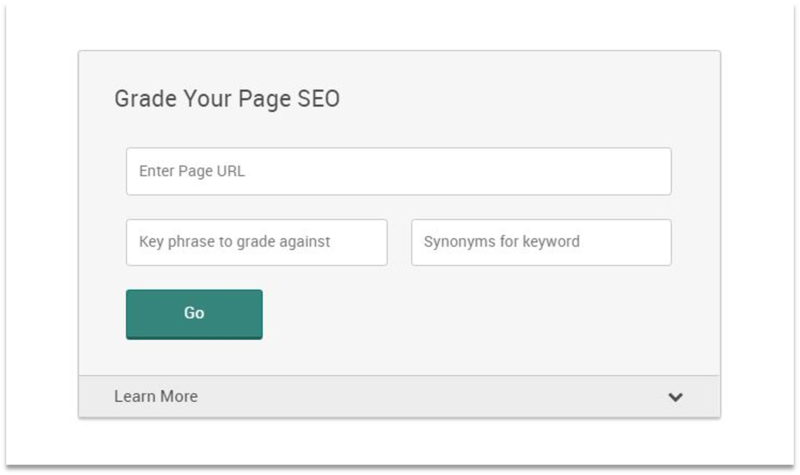 And you can use Pagezii’s SEO Keyword Tool to hone in on search intent. This is the over analysis for your target keyword. You can then get a detailed look at each result. Here’s where you can hone in on competitors, and see if they’re targeting search intent. 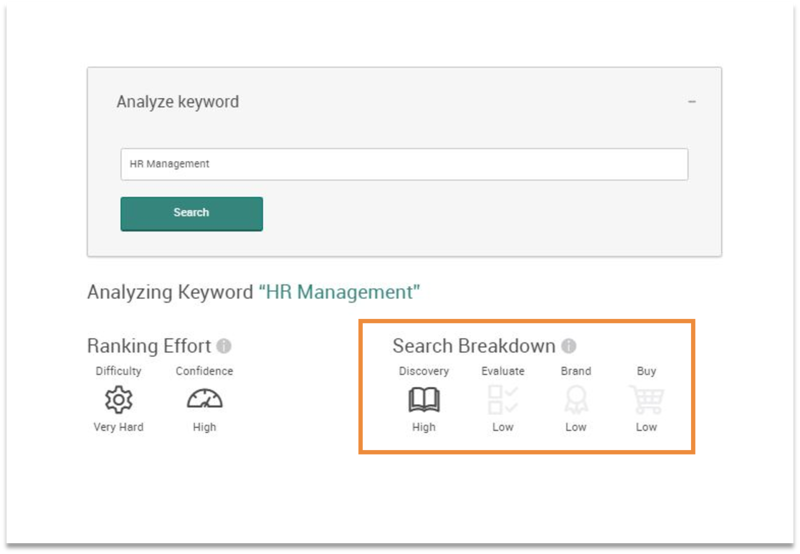 By analyzing search intent, you can shift your own target keyword strategy. Your goal here is to align with the real intent behind a user search. So check to see if competitors are optimizing for search intent, and tweak your content accordingly. A great way to leverage your competitor’s most successful SEO is to research their backlinks and content reach. Once you figured out what’s effective for their SEO, then work to get links and posts on similar publications, sites or listings as they have. There are plenty of opportunities to invent and reinvent the wheel with SEO. But leveraging what worked for your competitors is a good starting point. It’s important for businesses to track competitors in order to stay ahead in the game. Tracking backlinks provide an efficient way to see if competitors are winning keywords and what content is being published to win those keywords. From this data, businesses can then publish better content than your competitors. For example, if the backlinked content is a top ten listicle, you can create a top twenty listicle. Follow through by contacting the owner of the content where the backlink was found to encourage them to switch out the competing link for your improved one. Create Google Alerts for your top competitors. This will allow you to see the kind of press your competitors receive and where they get links. With this, you can deconstruct competitor PR strategies. You’ll also know when your competitors publish new content which will provide insight into their ranking strategies. Google Alerts allows you to monitor competitors and adapt your SEO strategy to accommodate trending information. You’ll be able to solidify your positioning amidst your competition and resonate strongly with your ideal audience. I like to use competitor and brand tracking tools such as BuzzSumo and Mention, which send me daily reports of any mentions of our own brand and also our competitors across the web and on social media. Staying in the know, in real time, is crucial to being able to react in a timely manner to what’s trending for your brand and your competition. Keeping an eye on competitor site architecture is useful if you want to establish a possible parent and child page hierarchy for your own site. It will also help you to determine any potential product or content gap that you could apply to yourself, provided that it makes sense for your business. This is particularly useful if your competitor is consistently creating new pages on their site. Pay close attention to how rival businesses are advertising on Google. Your competitors will obviously be bidding on keywords which are important to them, and if they’re sticking with particular groups of keywords over time, it’s likely that these convert well. Tools such as Spyfu allow you to check on and track how much your competitors are spending on PPC, which keywords they’re targeting, and how well their ads are performing. For enterprise websites, tracking competitor keyword performance could mean knowing the performance of 100 or more competitors. It only becomes manageable with keyword tracking that charts how your average rank per category compares. Make it a part of your routine to review keyword performance every day. Investigate surges in competitor traffic by category so that you can respond quickly to ranking fluctuations. Create a list of the keywords where your competitors improved to discover SEO tactics that you could use or boost your site’s performance. 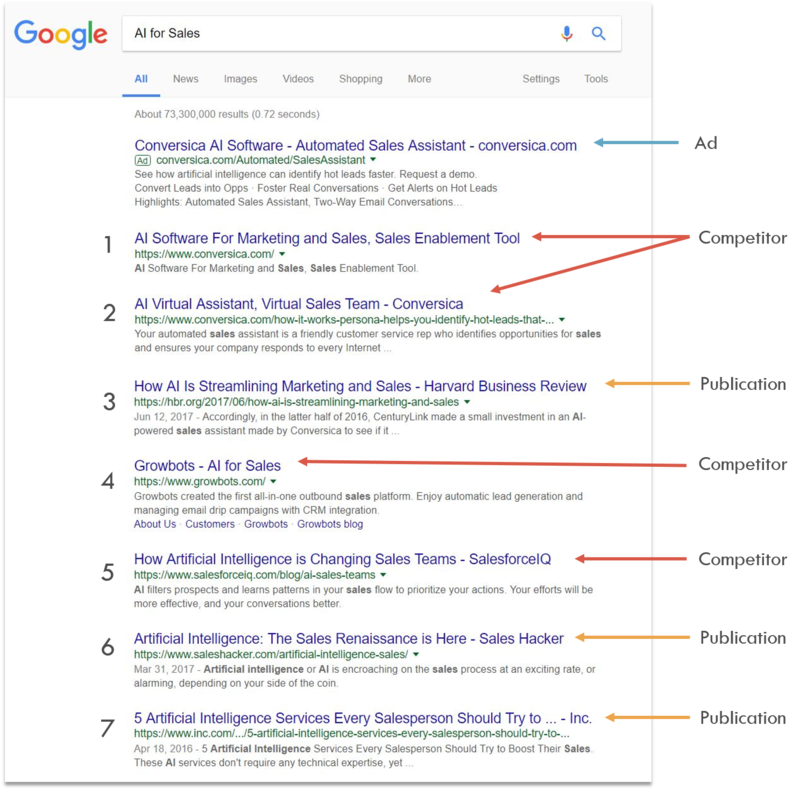 Look at the competitor’s pages if they’re ranking above you in the SERPs and add them to your list of keywords. In addition to eyeing close competitors, marketing managers need to understand what Google and Bing consider relevant for the queries they care about most. It’s essential to track rank outside of traditional competing businesses or organizations and monitor the movement of all sites competing for priority keywords. For example, a health insurer may be competing for results with other insurance companies, governmental entities, and information sites alike. Because results pages are always changing, it’s key to keep track who is ranking for what and how those results are being displayed. In certain circumstances, monitoring and adapting search strategies ahead of traditional competitors and informational websites can yield a ranking advantage. Analyzing your competitive landscape is key to improving your own strategy. Because it gives you insight into how your industry uses SEO to drive business. Are you building an SEO competitor analysis report? Need a template to get started? No sweat – Pagezii has you covered. Download the SEO competitor analysis template and start developing your data-rich report.